Women seeking a Fall River breast enhancement should visit Dr. Russell Babbitt of Plastic Surgery of Southern New England. Dr. Babbitt is known for his surgical skills, compassionate care, and dedication to answering any questions and concerns. Knowing all the benefits and compromises of the different types of breast implants will help you make an informed decision. Dr. Babbitt now offers the IDEAL IMPLANT® Structured Breast Implant for women who want the beautiful look of silicone-gel implants with the peace of mind of saline. Traditional saline filled implants tend to ripple, lose their shape, and look unnatural. The IDEAL IMPLANT® is filled with saline but contains an internal structure giving it stability and movement that resembles the natural appearance silicone gel implants give. The saline inside means women will have the peace of mind that if their implant ruptures it will be evident immediately and the saline will be naturally absorbed. Now women can have a beautiful looking breast enhancement with peace of mind. The IDEAL IMPLANT was developed to address common concerns women have about silicone-gel breast implants. According to a recent survey of over 900 women, 98% of respondents stated they would be somewhat to constantly concerned about their silicone gel implant rupturing. The saline filling of the IDEAL IMPLANT means women do not need to worry about a rupture. Also, when compared over a seven year period to the silicone gel implant brands, the IDEAL IMPLANT has a lower rupture rate and a lower capsular contracture rate. Breast implants should leave you feeling comfortable and confident about your body, not concerned about a rupture or contracture. 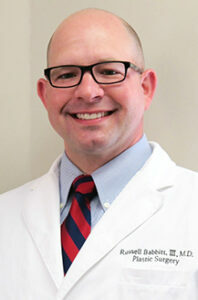 Women seeking a highly skilled surgeon in Fall River should contact Dr. Russell Babbitt. A Massachusetts native, Dr. Babbitt received his medical training from University of Massachusetts Medical Center. Dr. Babbitt is a board-certified surgeon and specializes in all forms of cosmetic and reconstructive surgery. His patients have come to expect a high level of skill as well as compassionate concern for their medical care before, during, and after surgery. Dr. Babbitt is one of the exclusive surgeons in Fall River to offer the IDEAL IMPLANT® Structured Breast Implant. Considering breast implants in Fall River or researching Fall River breast enhancement? Contact Dr. Babbitt today to discuss your options. Simply call 508-567-3202 or visit www.plasticsurgerysne.com. Dr. Babbitt’s office is located at 300 Hanover Street, Suite 1A, Fall River, Massachusetts 02720. Call today for more information on IDEAL IMPLANT ® Structured Breast Implants.